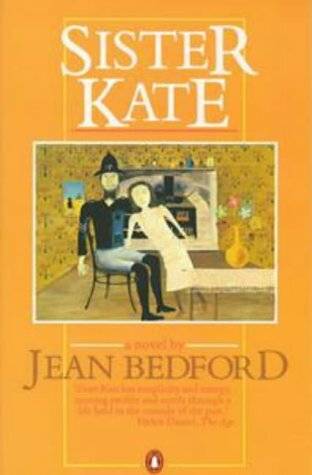 Sister Kate, by Jean Bedford, is a slim novella from 1982, fictionalising the life of Kate Kelly, the sister of the bushranger Ned Kelly. It is no accident that the cover is graced by Sidney Nolan’s painting ‘Constable Fitzpatrick and Kate Kelly‘: Fitzpatrick’s womanising is said to have been the catalyst for Ned Kelly’s life of violent crime. But the exploits of the Kelly Gang are not the focus of this novel. It is the effects on the women of the family that is of interest. Kate is a wild child who hero-worships her brother and believes he can do no wrong, and when by page 61 it is all over for the gang, she is left with only a demoralised brother, a mother broken by the demise of her two sons and the memory of her first love, Joe Byrne, who was shot and killed in the shootout at Glenrowan. With nothing left but bitter memories Kate tries to make a new life. She has a stint as a barmaid, becomes an assistant to a showman who breaks in horses, and finally meets her eventual husband Bill while she is working as a domestic. Throughout this period she has been supported by a sisterhood of sorts: they are tough women with problems of their own but they care for her when she succumbs to consumption (TB) and although they have always tactfully pretended not to know who she really is, it is they who get help from the remnants of her family when things reach crisis point. Bill’s not a bad fellow but he’s entirely inadequate to support a woman suffering post-traumatic stress disorder and depression. Kate is haunted by the image of Joe’s burnt body on grotesque display at the Benalla Police Station, and she takes to drugs and drink to try to forget. And as she sinks further and further into a fantasy world where Joe has come back to her, her neglect of her little children shows how criminality impacts on one generation to the next. Part One of the novel is a bit confusing unless one is familiar with the Ned Kelly story. There are multiple characters and I lost track of some of them from time to time. (If I’d read Peter Carey’s True History of the Kelly Gang it might have helped, I’ll get round to that one day!) It is in Parts Two and Three of Sister Kate that the novel became more interesting as it traced the decline of a bright and lively though wayward girl. It’s a sympathetic portrait of Kate, depicting her as a prisoner of circumstances and unable to escape her own demons. But it’s a novel of its author’s era too, exploring a local myth from a feminist perspective, and showing Kate as a young woman with sensual needs and some ambition, albeit modest. She has more gumption than her brother Jim, but had less opportunity to transcend her reputation because the myth-making had started and she was lionised in public discourse and song before she had left her teens. And once she left for the city, there was little opportunity for satisfying work that made use of her skills in horsemanship. We need more novels like this one, deconstructing the historical past to show the human cost of events in Australia’s past. Jean Bedford writes reviews at the Newtown Review of Books and is the author of a number of novels, mainly crime. Source: Central Highlands Regional Library via inter-library loan, with thanks to Bayside Library. Availability: out-of-print. Try Brotherhood Books. Update 8/3/18: Not out of print anymore! This title has been reissued as an eBook by LF Books. You can find it here.